I've made marshmallows for smores, for topping a brownie cakes, and for just plain old hot chocolate. These make perfect party, host or holiday gifts - just drop the marshmallows in a plastic bag or box with a pretty bow and label. Voila, you have a fun, festive, fat and happy gift that will mean more than anything store bought! Fat and Happy Food Blog Tips and Techniques: With this recipe, the outside of the marshmallow gets an almost crunchy layer while the inside stays mellowy; it's a great texture. 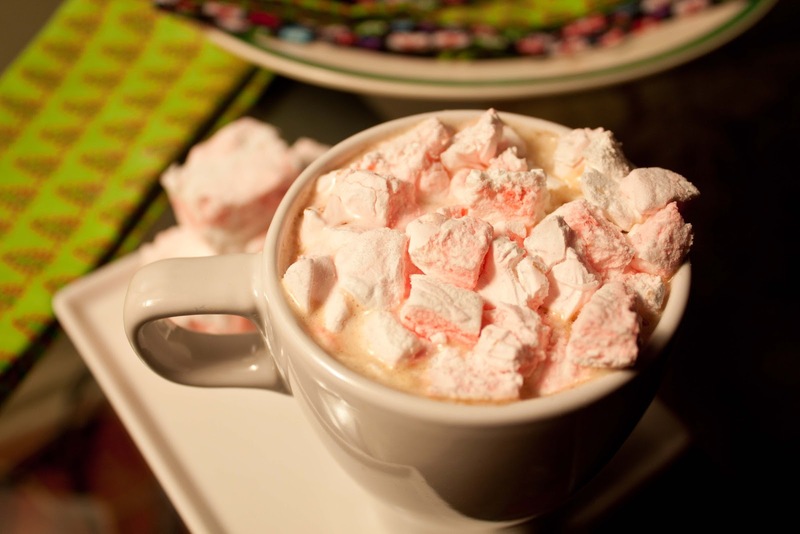 If you prefer a marshmallow more reminiscent of the 'bagged' kind, simply beat 2 egg white until soft peaks form and then add to the sugar mixture at the same time as the flavor extract right at the end. Butter the bottom and sides of your pan and dust with confectioners (powder) sugar. If you want thick marshmallows, use a cake pan. For miniature marshmallows, use a cookie sheet. In the stand mixer bowl add the cold water and sprinkle the gelatin over over the top, let stand to soften about 15 minutes (or until your sugar mixture is ready). In a heavy saucepan cook the granulated sugar, corn syrup, hot water, and salt over low heat, stirring with a wooden spoon, until sugar is dissolved. Cover and let simmer for 3 minutes to help dissolve any remaining sugar on the sides of the pan. Uncover and increase heat to medium to boil the mixture, without stirring for about 7 more minutes. If you have a candy thermometer, the goal is to reach 240°F. Remove pan from heat. You can use the whisk or paddle attachment on the stand mixer; I think the whisk produces a slightly fluffier marshmallow but the paddle is a little easier when you are trying to get the sticky mixture out of it. With the stand mixer on LOW, slowly pour the sugar mixture down the side of the mixing bowl into the gelatin mixture, stirring until gelatin is dissolved. Place a kitchen towel over the mixer and then turn to high. Trust me, the last thing you want is to get smacked in the face or eye with flying bits of caramelized sugar! Beat on high speed until the goo is white, thick, and nearly tripled in volume, about 6-10 minutes. If you are using a a hand-held mixer, this may take up to 20 minutes. Add in the vanilla (or other flavors) to sugar mixture until just combined. Using a greased spatula, pour or scoop mixture into powder sugared pan. If you want a colored-swirl effect, add a drop or two of coloring now, give the mixture a swirl with the spatula. This is a sticky, sticky substance at this point so work quickly. Do your best to level the top and then sift a little powder sugar on top. 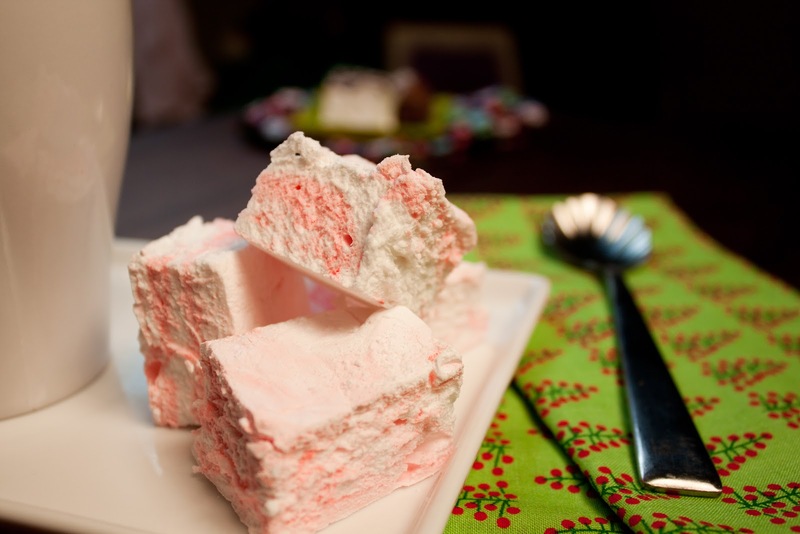 Let the marshmallow rest on the counter for at least 4 hours or up to 1 day. Sift about 1/4 cup powder sugar on a large cutting board or counter. You should be able to lift or flip the pan over to release the marshmallows. Run a knife along the edges to loosen if needed. Cut the marshmallows to preferred size using a pizza wheel or a kitchen scissors. Toss them in a little more sifted powder sugar to coat all sides. Store in an airtight container at cool room temperature for about 1 week. 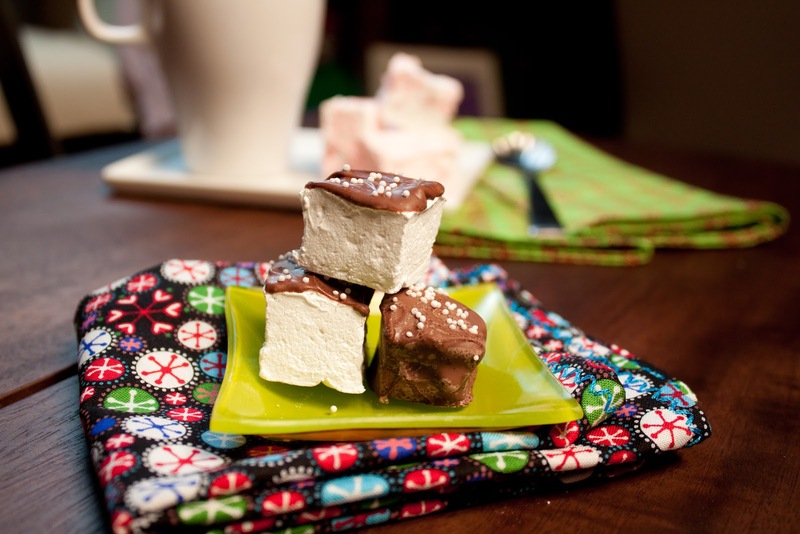 Try chocolate covered marshmallows by dipping the marshmallows in melted chocolate. Add colorful sprinkles or toasted slivered almonds or coconut after dipping for added flavor and effect.